Cosmic Express is a cute and surprisingly difficult puzzler about guiding aliens through a space colony. It's easy to pick up and offers a lot of challenge underneath all the bright colours. It's this week's indie pick! The goal is pretty simple: get the aliens where they need to go on a one way track. Each map poses a puzzle with creatures of various colours that need to be dropped off along the track. Clicking and dragging the mouse allows you to draw your pathway. Finding the right order to navigate stops and dodge obstacles starts easy but builds to become one hell of a brain teaser. 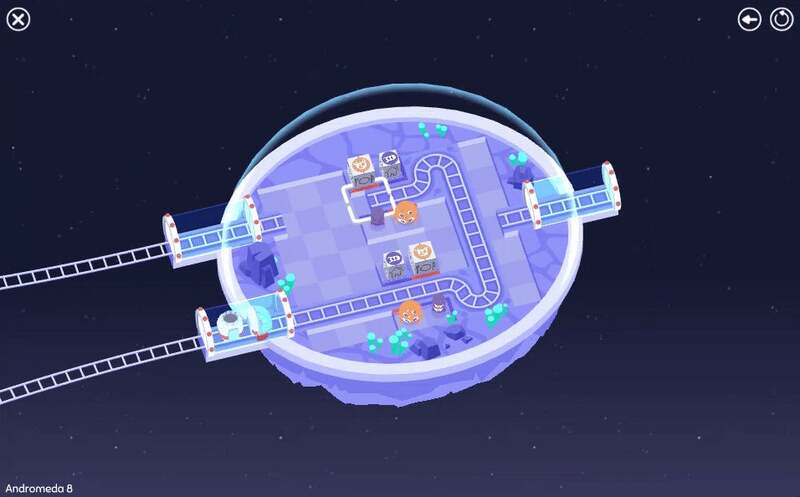 One of the best things about Cosmic Express is that you almost always can back out and head to another level or solve a previous puzzle's alternate solution. You're rarely even forced to slam your head against one puzzle for too long if you don't want to. "From my experience with [previous games] I already knew that having levels branch out is really important for a game like this," designer Alan Hazelden said. "You always have a choice of levels and you're not just stuck on one level." Eventually, new complications pile up. There will be airlock doors in your way or aliens that leave behind slime that leave a train car unusable. If you are left scratching your head, it's not because the rules are confusing; it's because the puzzles are just that tricky. I'm not a puzzle game player. I came for the alien chums. But Cosmic Express has definitely caught my attention with its brain teasers. You can play it on all major operating systems. "You can play it on all major operating systems."